Do you remember Wooly Willy? The simple kids' toy, dating back to the 1950s, let you use a magnet-tipped stylus to place iron filings on a cartoon character's face. It's been 60 years, but apparently the technology needed to let you do the same photos has only just recently been perfected. 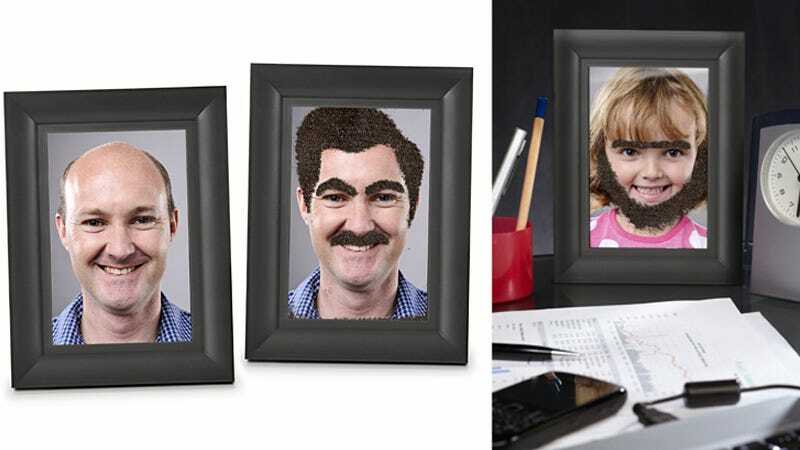 The Fuzzy Face Photo Frame lets you add beards, mustaches, even broken teeth to your own 4x6 photographs, but that's not its only innovation. Any attempt to move the original Wooly Willy toy resulted in all your hard work being jostled and destroyed, but this $18 photo frame has a special magnetic lock that holds all the filings in place when you prop it up. A mind-blowing technological achievement that will probably just fuel our parents' laments that kids have it too easy nowadays.